Just like snowflakes and people, each puppy is unique and one-of-a-kind. Even among littermates or subsequent litters out of the same parents, you won’t find two puppies who are the same. And just like snowflakes and people, puppies age. All too soon the seasons pass and that playful puppy grows old. No matter how many years we are blessed with the companionship of a beloved dog, they always leave our lives far too soon. And when they do, we are left with our memories, a sense of emptiness and a longing to fill it. Often, when someone has an ageing dog, the owner will add a new pup to the household before loosing the old one. This can be a good idea because it gives the owners the opportunity to accept the new pup for who he is. The addition of a new pup will often spark a bit of new life in the older dog. As long as the pup is not allowed to annoy or tire the older dog, this can be a good situation for all. When that day comes, and the old dog passes on, it can be a great comfort to already have a younger dog in the owner's life. 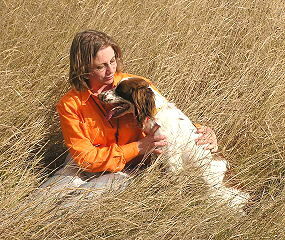 Occasionally, I get an inquiry from someone whose springer has recently passed away. Often, it was a special dog with whom they shared a close relationship. A member of the family. Most are looking for a new pup to share their lives with... to become a hunting buddy... to love. But sometimes, the distraught owner is looking for a "replacement" pup and expects one who will be a carbon copy of their dog that died. Not only is that an impossible expectation for any puppy to fill, but it is unhealthy. It’s not fair to any new puppy for its owner to constantly compare him to the former dog, just as it isn’t fair to a child when teachers or parents try to compare him to an older sibling who excelled. "If the person's motivation for getting a new puppy is a result of wishing they could have another dog just like the one they’ve lost, it’s not time to bring a puppy into their home. Some people may never be ready for another dog." In order to successfully bring a new puppy into a grieving family, it may be best to first allow some time to pass. In other cases, having a new puppy in the home can help to ease the grief. Either way, it is important that when a new puppy is brought home that he be accepted as exactly that... new. So, how can a person who has lost a special dog that they were so emotionally attached to avoid this trap? He must come to realize that the deceased dog is a part of the past and that book is closed. Cherish the time spent together and savor the memories. Don't fall into the trap of projecting a desire that the new puppy be identical to the deceased dog, because doing so is setting yourself up for disappointment and the relationship will fail. If the person's motivation for getting a new puppy is a result of wishing they could have another dog just like the one they’ve lost, it’s not time to bring a puppy into their home. Some people may never be ready for another dog. It may be a good idea to select a new puppy who does not physically resemble the deceased dog - either one that is another color or another breed of dog, entirely. But if the person can accept that the new puppy is the here-and-now and is an entirely new opportunity to build a special relationship, as well as future memories, go ahead and find your new pup. Appreciate the new puppy for his own special uniqueness. Find joy in the simple pleasures of watching him fall asleep in your arms, discovering butterflies and taking long walks together. Give your new pup the opportunity to show you what makes him special. When it is time to add that new puppy to your family, be sure that it isn’t an impulsive, spur-of-the-moment decision. Don’t go and look at any puppies until you have taken the time to do your homework. The internet is a wonderful and valuable resource for educating yourself about various breeds of dogs and in locating knowledgeable breeders. Learn as much as you can about the pros and cons for the breed(s) of dog you are considering. Even among one breed of dog, there are important differences between various bloodlines. What is the dogs’ full-grown size? Is it well-suited to living in the house? What is it’s energy level? How much daily exercise is required? How will it get along with children or other pets? Are they easily trained - or is it likely you will need the help of a professional trainer? If you are looking for a hunting buddy, does it’s hunting style suits yours? Do the parents have a good nose, stamina and are they natural retrievers? Just like people and every other living thing on earth, all dogs have genetic imperfections. There are health issues associated with every breed of dog - and even mixed breeds. Mixed breeds can be afflicted with health problems common to any and all of the breeds of dog in their background. Educate yourself. Find breeders who are knowledgeable and complete genetic health screenings for their dogs to minimize the risk for these conditions in their offspring. What about buying a dog from an animal shelter? If you are looking for one that will strictly be a pet, you may want to consider finding it in an animal shelter. But be aware that many shelter dogs may have issues that make them unsuitable for families with children or other pets. Some are in shelters due to expensive health issues. Others are there due to behavioral issues. Most are mixed breed dogs of unknown origins. Even if the shelter employees claim it may be a particular breed, in most cases, it’s just an uneducated guess. Unless they can produce the dog’s registration papers, it is not a purebred dog. If you do find a hunting breed dog in a shelter, be aware that the reason why it may be there could be that it doesn’t hunt. So, where does a person find a good puppy? 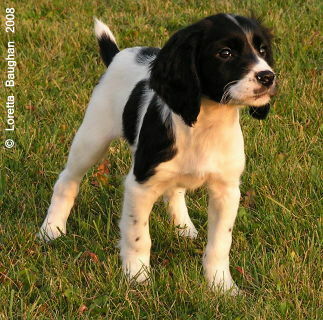 Look for breeders with home-raised puppies. This is your very best source for a well-socialized puppy. Contact breeders by e-mail or phone and ask questions. A good breeder should welcome the opportunity to provide you with answers and will be pleased by your interest. Be prepared to answer questions from the breeder. Your choice of a breeder is just as important as your choice of a puppy. 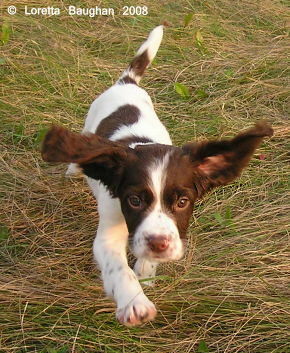 A good breeder wants to be sure that their puppies go to homes where they will be well cared for and loved. A good breeder will be familiar with the personality and temperament of each pup or dog and will help you to select one that best fits your lifestyle. A good breeder will provide you with the puppy’s registration paper and complete health record when you pick up your new puppy. 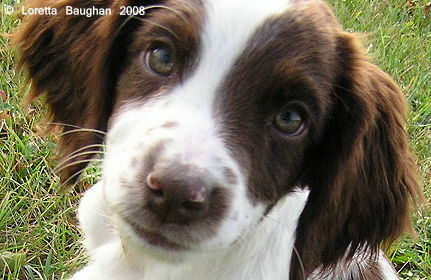 A good breeder will be available to answer your questions and offer advice for the life of your pup. A good breeder will cheer your dog’s joys and successes... then, as the seasons pass, they will share you pain when he slips away.